Today I thought I would write about my huge clean up on my blog. As a 'newish' blogger (I have been blogging just under a year) I know first hand how easy it is to get carried away adding unnecessary junk to your blog. My blog was beginning to look extremely cluttered and juvenile and I feel as though it wasn't visually appealing. Here is a screenshot of my old blog template design. I just used one of the supplied blogger templates and then edited the colours and widths. My header was made by me in PicMonkey I found my header size and hen created the header to fit. Even though the header was made to fit the outside of the lettering was blurry and looked tacky. My page bad was uneven and all over the place . As you can see the side bars were extremely cluttered which took attention away from the blogposts., e.g. the social media buttons were way too large and looked rather silly. 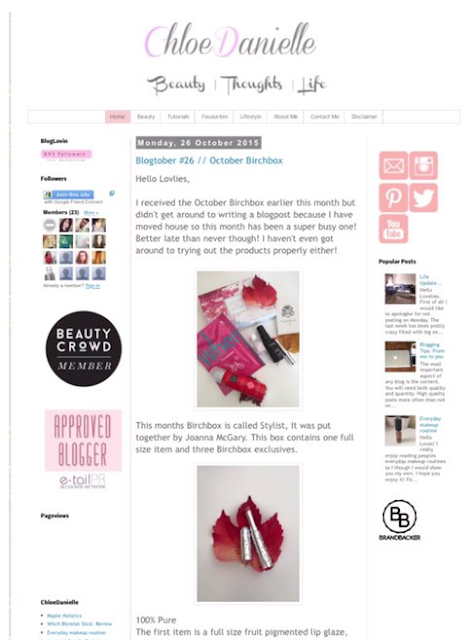 Finally my colour scheme was all over the place, I had several different shades of pink, Grey and blue which also added to making my blog look really untidy and unappealing. so... today I decided to have a browse on Etsy for new blog templates. 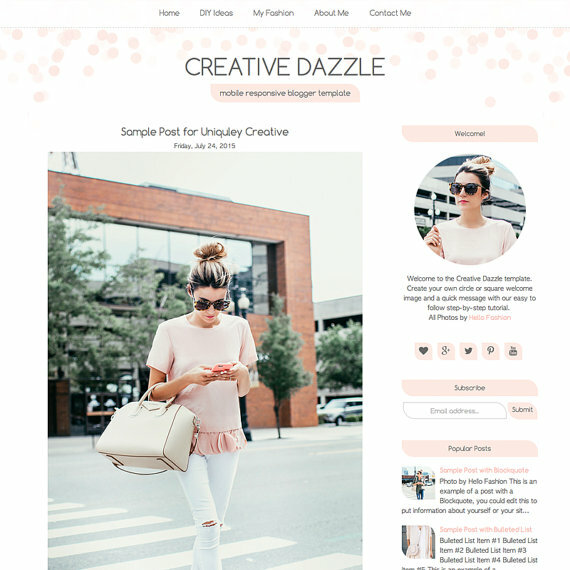 I spent so long browsing through different templates until I came across this one called 'Creative Dazzle' by Studio1Mommy (I will leave links below). What sold this particular template to me was the fact I could see a sample website with the template applied (see here). This template is an 'instant download' which appealed to me as I would be too impatient to wait for someone else to apply it for me. The instructions for this template were so clear and easy to follow, I had no problem installing it and making all of the relevant changes. As you can see from my blog my header is different to the one in the preview, well thats cause I made my own (I know right?..Mind Blown!). The 'in' thing right now is water colour strokes or brush strokes. I really love the soft look of them so I downloaded a new font to use in my header. I also searched on Etsy for Water colour swatches to download to have in my header too, I bought the ones from ankugraphics (I will leave links below). I then used PicMonkey to create it! I think my new header looks so much better than my old one as it is simple and generally a lot more appealing. What would you like to change most on your blog? It looks great! I definitely want to get a template before the end of the year but I just don't have time at the moment to play around with it incase anything goes wrong! You got it for a really good price too! I love my blog layout, but it stretches out my pictures too much and I have no idea how to change it! I also need a new header but I'm not sure what I want it to look like. Your new layout looks lovely! I love your blogs new look! The colour choice is beautiful! When I changed platforms I decided to start a fresh so feel free to take a look! I love the updates! Your blog looked good before, but it looks great now! Congrats!